Barking are the first side through to the semi-finals of this season’s Corinthian Cup competition after cruising to a comfortable 5-1 win on Sunday against Chingford Celtic. Two goals for each of Daniel Cook and Kastriot Vata were the difference with Bradley Marston also scoring for Barking to cancel out a Robert Teppett strike for Celtic. Their reward is a semi-final place against either Flanders or Liberty Stars. SL Menfica caused one of the upsets of the season in the Trophyland Cup as the Division Four runaway leaders beat the in-form Docklands Albion from Division Two to book a place in the semi-final. A 3-1 win was confirmed with a brace from Jordan Clark and James Dobson rounded things off with a goal of his own. Junior Kehinde was on target with the Albion consolation goal. In the other tie played on the day, an all-Division Two clash saw E4 Rangers run out 5-3 winners over Morfdown Elect in a goal-filled match. Elect goals from Adam Davis (2) and Aaron Hills were not quite enough on the day as Rangers goals from Tim Dye, Mitchell-Christopher Edmonds, Shaun Friel, Sam Prendergast and Macauley White completed a victory and confirmed a quarter-final spot. Upshire’s march to the title appears to see no end after another resounding win for the Waltham Abbey side carried them to an emphatic 6-0 win on Sunday against Warren United. Thomas Goodey scored twice with John Gregory, Jack Daveney, David Ayres and Dan Rowe also finding the back of the net to maintain their perfect record this season. Lactico remain in second place in the table after a comfortable 6-1 win over Downs in Hainault. Gozling Jenkins netted himself a hat-trick with Abdul Adegbola scoring twice and Henderson Browne finishing the job. Leon Lewis was the man on target for Downs with their consolation goal. Liberty Stars and Quality Control scored nine goals between them as an entertaining match saw the Stars move up to third place in the table, winning 5-4. Shamil Aggrey scored a hat-trick and Vincent Kwarteng bagged a brace to continue the Newham side’s purple patch of form. Completing a high-scoring theme to the division, Ainslie Wood also netted six goals as they beat Valentines United 6-2 in Barkingside. Jonathan Andrews and Gregory Blake were the men on target for the hosts with Ainslie moving up to seventh in the table. The leadership of Division One has changed hands once again with Emerson Park making their move on the league title with a thumping 7-0 win at Dagenham United to take over top spot. Goal scoring doubles from Joe Woolley, Ben Woolley and Kyle Paevie plus a strike from Mitchell Bacon secured maximum points on the day. Warren United Reserves were big 5-1 winners on their trip to Newbury Park to face Aldborough Hatch as they shifted themselves up to sixth in the table after a difficult start to the campaign. Harrison Slater scored twice with Darren Burns, Zane Faleye and Alfie Soutar all finding the back of the net to cancel out James Gibbings’ goal for Hatch. Another side showing much improved form are Valley Park who followed up last week’s victory with another on Sunday, seeing off Korona Redbridge by the odd goal in a 2-1 scoreline. Waldek Szydlowski got on the scoresheet for Korona but his goal was rendered a consolation as Ciaran Donnegan and Peter Turner scored for the hosts to secure the points. In one of the games of the day, a nine-goal thriller between Barking & Dagenham Wanderers and St Augustines ended in a 5-4 win for the Saints with Tom Neil netting a hat-trick and Sean Hall and Kyran Allen also scoring. Sam Coe scored twice in reply for the Wanderers alongside goals from Nick Read and Liam Roney but their efforts proved in vain. Waltham Athletic took full advantage of sides around them dropping points in the title race in Division Two with an important 3-1 on Sunday. David Ellis was on target for London Fire Brigade but three goals for Athletic were enough to take them to victory and to within a point of the leaders. First played third in the other big game of the day in the division as Westferry Elite and Park Tavern shared eight goals and went home with a point apiece. Two goals for each of David Hornsby and Kristopher Brown for Tavern were not quite enough to secure a victory. In another high-scoring draw, Lonsdale took a point at home to FC Mexico in a 3-3 scoreline. Dean Hendrickson, Sam Prince and Adam Roberts were each on target for Mexico but an Anton Gjergji hat-trick for the hosts saw the sides share the points on the day. 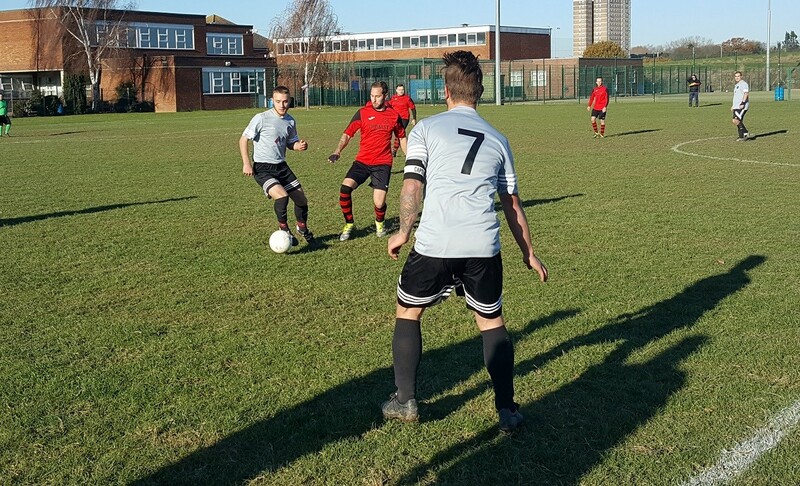 The Wanstead United stranglehold on top spot in Division Three sees no end as they cruised to a 4-1 win over the weekend against Alliance United. Kevin Davidson was on target for Alliance but a Jason Branche hat-trick plus a goal from Kane Greene means that the hosts now have a six point lead at the top of the table. That lead is now larger as a result of an excellent performance from FC United of Hornchurch who took a crucial point from their trip to Waltham Abbey to where they drew 2-2 with title chasing Upshire Reserves. Jack Marrion and Tyler Paterson were both on the scoresheet for Upshire but a goal from Lewis Honey helped his Hornchurch side to a draw. A nine-goal thriller saw a big 6-3 win for Ridgeway Rovers against Fairlop Rangers in a result which has moved the Chingford-based side up to fourth place in the table. Jaden Maloney scored a hat-trick for his side with Jordon Charles, Brian Ho and Carlo Boameh also netting to secure victory. Partizan CMC remain third in the league table following a 2-0 home win in Chigwell against Alpha. Goals for each of Callum Kennedy and Charlie Palline were enough to edge a victory and keep their side in the chase for the promotion places. Hornchurch Oakmont moved up to fifth place in the table on Sunday following a narrow win by the odd goal in five against Epping Forest Falcons. Michael Girling scored twice for the Falcons but a goal each for Charlie Woods, Luke Newman and Ross Woolward were just enough to take Hornchurch to a 3-2 win. Heathside are fourth in the table after winning 3-0 on Sunday against Grey Area in Chadwell Heath. A goal for each of Craig Ellis, Jamie Crews and Sam Owen were the difference on the day and ‘Side are now just a point off of the third placed Epping Forest Falcons. In the final league game of the day, Goresbrook were denied another victory as a last gasp Central Colts effort rescued a point for their side. Goals from Liam Coney and William Cox had taken Goresbrook to the brink but for Colts’ late leveller to make the score 2-2. In the London Sunday Trophy, AC Milano Reserves saw their run in the competition come to an end as they went down 3-1 to Sporting Continental in South London.